Baby's in Black by German graphic novelist Arne Bellstorf is yet another amazing book from FirstSecond that caught my attention right away. I went through my Beatles period when I was in junior high in the late 1970s and early 1980s. Beatlemania the musical and the movie version of Sergeant Pepper's Lonely Hearts Club Band had come out. I remember laying on the beach in the summer of 1982 reading Phillip Norman's SHOUT! 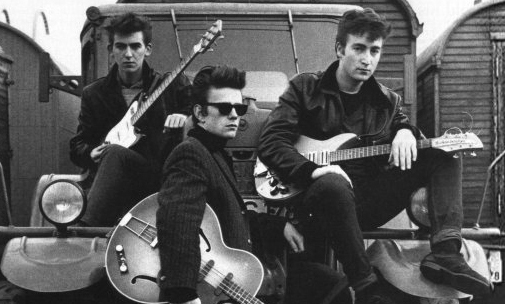 The Beatles in Their Generation. 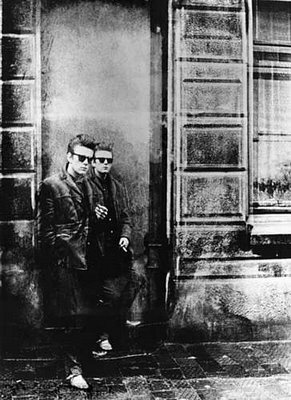 I remember being transfixed by the brief passage in the book about the Beatles' time in Hamburg, their transformative friendship with Astrid Kirchherr and Stuart Sutcliffe's early demise. 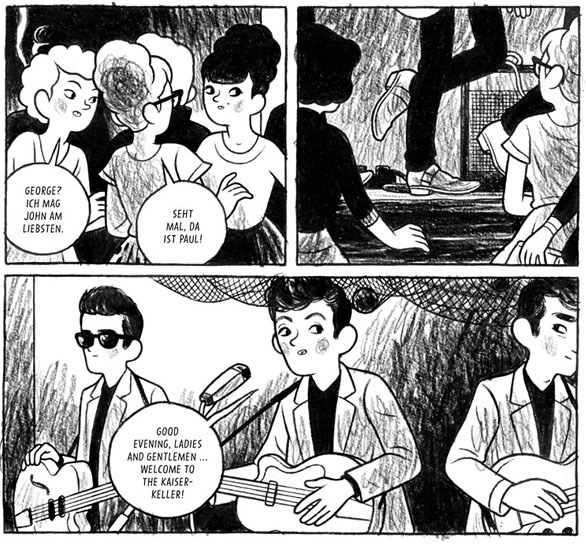 Of course I wanted to read a graphic novel about the fifth Beatle. That said, I don't think you need to know anything about Kirchherr, Sutcliffe or the Beatles to enjoy and appreciate this glimpse into what it was like to be young and creative in the early 1960s when society was on the verge of major changes. 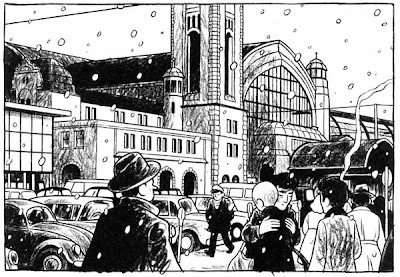 Arne Bellstorf has created a graphic novel that is visually and emotionally compelling and (I'd imagine) very evocative of the time and place. 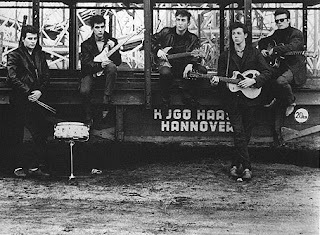 Baby's in Black, which is also a song by the Beatles from the album "Beatles for Sale" released in December of 1964 and said to be written by Lennon and McCartney about Kirchherr, is told from Astrid's perspective and begins in Hamburg in October of 1960 with a dream. Astrid is wandering through a forest, following a black scarf, when the ringing doorbell awakens her. Klaus, her friend from art school and former boyfriend, has been wandering through the Reeperbahn and heard the most amazing music. So amazing that he has to wake someone up to talk about it. He begs Astrid to come with him to this dank basement club the next night to hear this amazing band. The rest is history, at least for the Beatles. 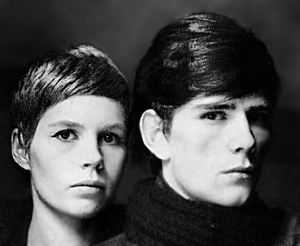 Astrid, a working photographer, will take professional photos of the band and will give Stuart the haircut that eventually leads the rest of the Beatles to their famous moptops. 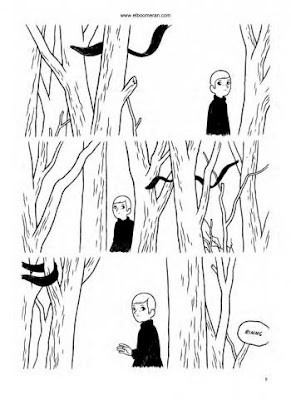 But that's not what Baby's in Black is about. 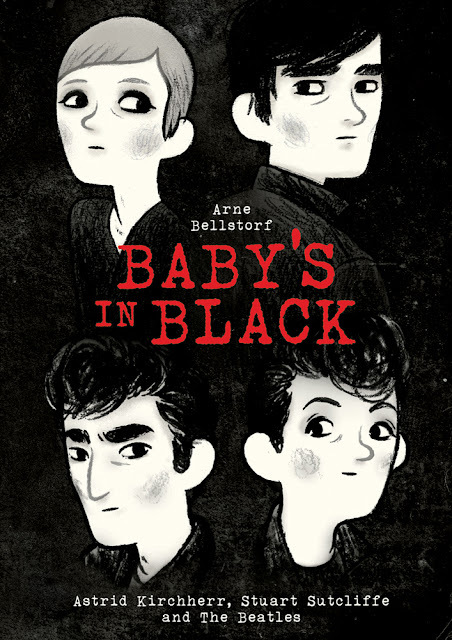 Baby's in Black is, at its heart, a love story. Cool and reserved, a standout for her style and looks, Astrid is clearly drawn to Stuart from the first time she sees him. 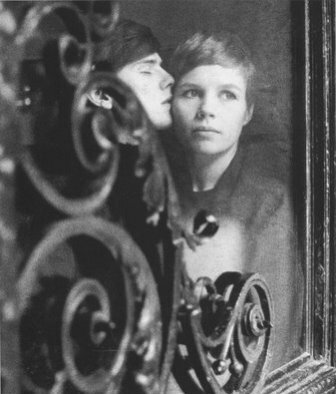 She and Klaus visit the the Kaiserkeller many times before working up the courage to talk to the band. Klaus (who goes on to have a long relationship with the Beatles and career as an artist and musician, designing the cover for the Revolver album and playing in various bands, including the Plastic Ono Band) wants to show them an album cover he has designed. A friendship is formed, despite the language barriers, and soon Astrid is taking their pictures, posing them on a truck with their instruments, and her mother is making them English tea, mashed potatoes and peas. When Astrid tells Stuart she would like to photograph him alone (and loans him her black scarf) they kiss for the first time. 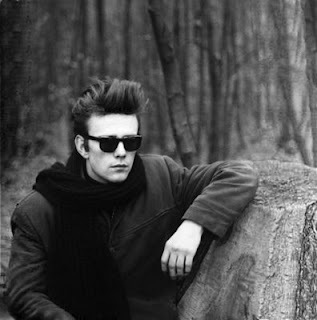 Bellstorf is a fine storyteller and works well with factual history and what may or may not be fact about Kirchherr's life, weaving together a meaningful story about two artists in love, repeatedly using the stark dream-forest setting to anchor the story and symbolize the connection that Stuart and Astrid have. Astrid recognizes the artist in Stuart and works to make room in her life for him. She lives with her mother who gives Stuart her attic to use as a studio. Astrid talks to her friends at the Hamburg College of Art and gets a scholarship for Stuart and a private meeting with Scottish artist Sir Eduardo Paolizzi who is taken with his work immediately. Stuart continues to paint, always striving for something better than before. His work from this time can be seen here. As Stuart and Astrid are submerging themselves in the world of art, the Beatles get their first record contract, playing on Tony Sheridan's single "My Bonnie." John tactfully asks Stuart if he minds if George takes over the bass for this gig, as his playing is better. More interested in his art, school and Astrid, Stuart gracefully bows out. The band returns to England for a time, mostly to get proper work papers and for George to become old enough to play in a club at night and Stuart and Astrid pursue their artistic lives and careers. Just when things seem to be going smoothly - Stuart has proposed to Astrid, they have been a couple for over a year, their careers are going well, Stuart's mysterious illness intensifies. Stuart dies of an aneurism just before the two are about to marry and move to Paris. A few days later, Astrid meets John and Paul in the airport as they return to Hamburg for a string of shows at the Star Club. Baby's in Black ends with John hugging Astrid then asking, "But where's Stuart?" I guess it's impossible to read this book without being equally fascinated by everything that Bellstorf left out of the story. Kirchherr, at the airport to meet Sutcliffe's mother as she flew to Germany to bring home her son's body, was the first person to tell the band of Stuart's death. 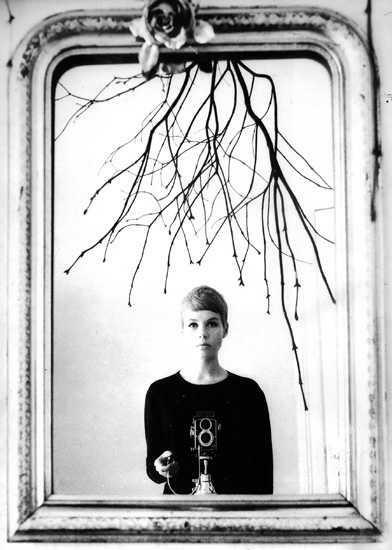 Kirchherr went on to serve as the Beatles' photographer during the filming of A Hard Day's Night but retired from photography and public life in 1967.